February was a month that saw more unsettling scandals from Donald Trump’s White House than even his biggest critics could have imagined. They run the gamut from Jared Kushner’s bank loans, to insulting his Attorney General Jeff Sessions as “disgraceful,” to contradictory positions on gun control, to Hope Hicks telling “white lies,” to 13 new indictments by special counsel Robert Mueller. And I could go on. “To rapturous applause, Putin said the new technology had been developed despite skepticism from other countries about Russia’s capabilities. “‘I want to tell all those who have fueled the arms race over the last 15 years, sought to win unilateral advantages over Russia, introduced unlawful sanctions aimed to contain our country’s development … you have failed to contain Russia,’ he said. That’s right. Trump is complaining that Obama wasn’t tough enough on Putin. 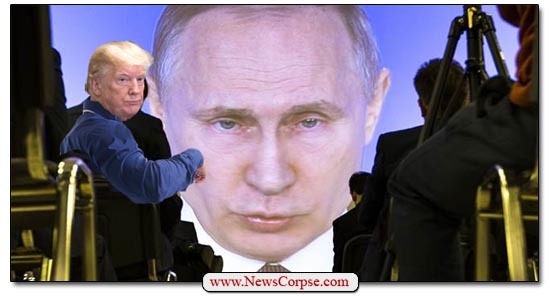 Never mind that Obama did impose sanctions on Russia, ejected more than thirty Russian operatives, shut down two Russian facilities, and sought a bipartisan agreement on additional measures that was shot down by GOP senate leader Mitch McConnell. And if Trump was so upset by Obama’s response to Russia’s annexation of Crimea, then why hasn’t Trump done anything about it in the past year? And with Putin’s announcement of adding new, more advanced missiles, Trump’s tweet seems to apply more to himself than to Obama. It’s Trump who is even worse than weak, he’s submissive. So once again Trump has proven that he is an empty suit that has no idea what he’s doing or saying. He will lash out at anyone who piques his ire at a given point in time, but forget all about it after the next scandal erupts – or after watching Fox and Friends. His ineptitude and limited attention span make him an imminent danger to the nation. And there always seems to be a tweet wherein he affirms everything that everyone worries about with regard to his flagrant incompetence.